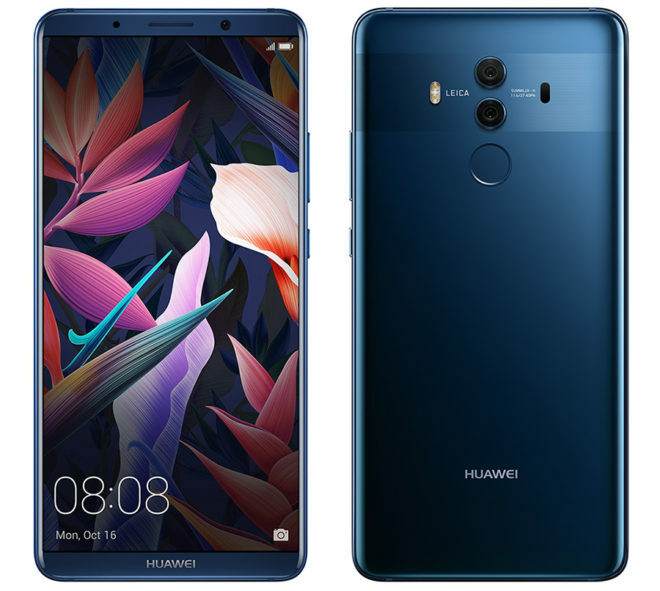 After launching internationally last year, Huawei’s Mate 10 Pro is now coming to the U.S.
Huawei today confirmed that the Mate 10 Pro will launch in the U.S. in February. Specifically, it’ll be available for pre-order starting February 4th and will launch on February 18th. The phone will be available from Amazon, B&H, Best Buy, Microsoft, and Newegg for $799. The Huawei Mate 10 Pro will be sold as a GSM unlocked device. I’ve asked Huawei about the Mate 10 Pro’s wireless band support and will update this post when they respond. Specs for the Mate 10 Pro include a 6-inch 2160×1080 OLED display with slim bezels and a Leica-branded dual rear camera setup. There’s a 20-megapixel monochrome sensor and 12-megapixel RGB sensor on the back of the phone along with a dual LED flash and f/1.6 aperture. Huawei touts that its cameras offer real-time scene and object recognition as well as a bokeh effect. There’s also a fingerprint reader below the Mate 10 Pro’s rear cameras, and the front of the phone is home to an 8-megapixel camera. The body of the Mate 10 Pro features “3D Glass” and is IP67-rated for dust and water resistance. Inside that body is an octa-core Kirin 970 processor, 6GB of RAM, and 128GB of built-in storage. A 4,000mAh battery powers the entire package and there’s a USB-C port for recharging that battery. Huawei is including a USB-C-to-3.5mm adapter with each Mate 10 Pro, too. On the software side, the Mate 10 Pro comes with Android 8.0 Oreo and Huawei’s EMUI 8.0. Huawei touts that you can use EMUI 8.0 to do things like connect your Mate 10 Pro to a monitor and use it like a desktop PC or use apps with a multi-column display to make performing tasks easier. Huawei also confirmed today that it will launch the Porsche Design Huawei Mate 10 in the U.S. on February 18th. 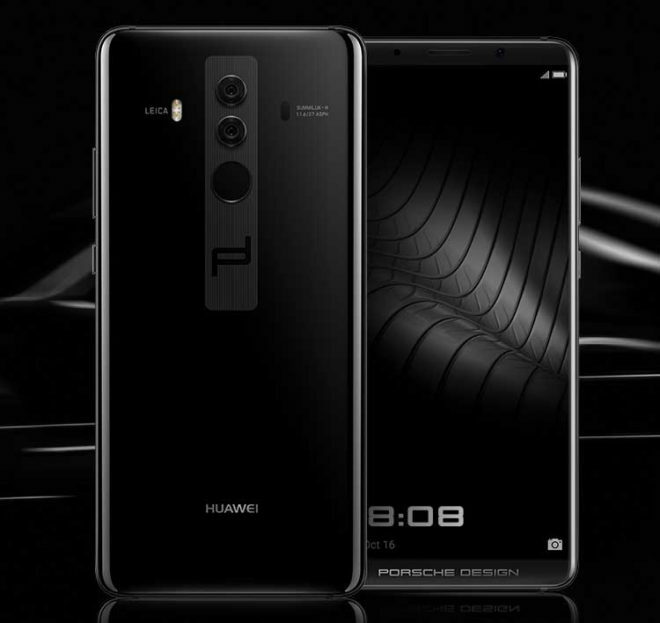 This premium device has Porsche Design branding, an exclusive Diamond Black color, and a “unique front and back cover design.” It’s similar to the Mate 10 Pro in terms of specs, but it does come with 256GB of storage. 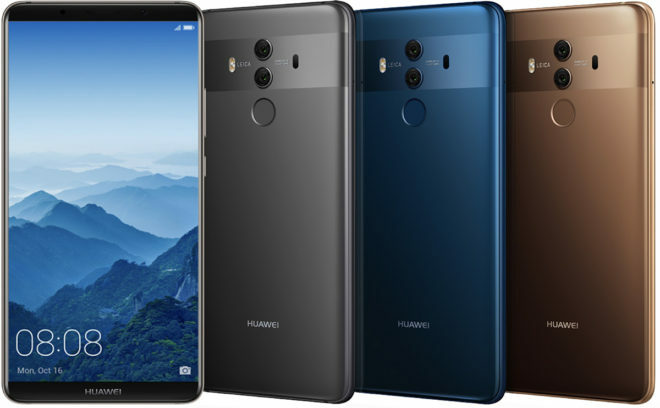 The Huawei Mate 10 Pro launched internationally towards the end of 2017, and so it’s good to see Huawei bringing it to the U.S., too. The lack of carrier availability may deter some people since you’ll be paying full price for the Mate 10 Pro rather than getting it in installments from your carrier, but it is nice to have the option of easily buying the Mate 10 Pro so long as you’re cool with buying it unlocked. What do you think of the Huawei Mate 10 Pro? Does it have a micro SD slot? Good luck getting an answer from Huawei. I asked on Facebook if it supported VoLTE and Wifi Calling. They responded to me twice, but never answered the question. For what it’s worth, the Mate 9 supported VoLTE but not WiFi Calling on T-Mobile. I’d expect the same at the very least! I know that Huawei, also cut corners with FCC and 5Ghz WI-FI on their Flagship Huawei M3 8.4 tablet, they didnt pay for certification. But it can be turned on if you root the device. But it would be Pirate W i-Fi haha. But M3 tablet I love the 16:9 of the 8.4 screen, My LG 8.3 pad from Winter 2014 needs a battery replacement, while people are running that tab with 7.x, love LGs innovative ideas an UI. Over other than the battery, I think that a reset would do it wonders, so till I can source a battery, I may just buy the M3. So I figured I will wait a little longer to coinsider the Huawei M4, a lot of the 32GB version seem to be in limbo for OTA to Android 7.x. I checked out the latest LG pad at Tmobile, the battery speaker expansion pack looks neat, but it comes with only 2GB for apps and OS and has a older snapdragon from a middle level device. Tried the Galaxy S2/S3 tablets, the S3 was a disappoint at price point and I fouunf I really prefer 16:9 over 4:3 screens. $800! Good luck with that. 1080p is out of place in an otherwise high end device. Not somewhere you traditionally cut corners. While the Mate 10 Pro does have some really nice extras that other flagships lack : large storage, USB 3, IR, etc., at the end the day all the posters below me are really, really on point- for just a few more dollars you can get a larger screen with QHD, SD card slot, individual carrier features/bands, etc. In fact, not being associated with a carrier can add more risk – original bugs may never get fixed; we have witnessed non-mega makers like ASUS, Lenovo, ZTE, ONEPLUS, Xiaomi, etc. abandon their releases. I would only risk $275 as is / $450 WITH a larger screen, QHD, & sdcard slot / and the present asking price with all Tmo features/bands & rootable. I know such price points are unfeasible, but it’s otherwise too much risk to undertake here in the Western Hemisphere. There’s enough “Made in China” crap out there! Not interested in adding more to my collection, not to mention security issues. I don’t want to shock you or anything, but pretty much every phone that is in the US is made in China. I think he means not “totally / end to end” Chinese; the “brand / foreign company” exerts quality control, and at least works on the software side of things. Brings to mind the post WW2 Baby Boomer era: when made in Japan signified cheap, low quality. It’s a sad state that everything is made almost exclusively there, and that the independents that can unshackle us from the big players don’t have the wherewithal to provide a quality, bug-free product. Will Huawei be released in the US as unlocked or network locked? There are quite some contrary information out there, so I don’t know exactly what will happen.